LOUNGE WITH DINING AREA 23′ 6" x 11′ 11" (7.18m x 3.65m) Having a mock beam ceiling, two single panel radiators, feature stone inglenook style fireplace with a gas effect stove, power points and double glazed windows giving aspect over the front. KITCHEN 14′ 9" x 11′ 0" (4.50m x 3.37m) Having a range of fitted units comprising wall cupboards, granite worktop surface with Belfast sink with a range of drawers and base units beneath. Part tiled walls, power points, mock beamed ceiling, plumbing for automatic washing machine, slate tiled floor, radiator, double glazed window to rear, integrated freezer with matching front décor panel, space for a Rangemaster oven, stable type door giving access to the side of the property, double glazed window giving aspect over the front. SITTING ROOM 12′ 11" x 11′ 8" (3.96m x 3.58m) With double panel radiator, power points, feature fireplace with electric fire, double glazed sliding door giving access to the side of the property and double glazed window with deep sill enjoying an aspect over the front of the property with far reaching views towards the Vale. LANDING Storage cupboard which is housing a free standing boiler which is supplying the radiators and domestic hot water and velux window. BEDROOM ONE 12′ 0" x 8′ 10" (3.66m x 2.70m) Double panel radiator, power points, double glazed window giving aspect over the front enjoying fantastic views. EN SUITE SHOWER ROOM 7′ 6" x 3′ 0" (2.30m x 0.93m) Having a three piece suite comprising purpose built shower cubicle, low flush w.c., pedestal wash hand basin, chrome heated towel rail, part tiled walls and inset spotlighting to ceiling. BEDROOM TWO 11′ 2" x 8′ 7" (3.42m x 2.64m) With radiator, double glazed window enjoying fantastic views over the front elevation. BEDROOM THREE AT PRESENT USED A DRESSING ROOM 12′ 0" x 10′ 10" (3.68m x 3.32m) With tongue and groove floor, a range of fitted wardrobes, radiator, double glazed window giving aspect over the front enjoying fantastic views towards the Vale. Double glazed French Door’s giving access onto a rear decking area. BATHROOM 8′ 3" x 5′ 11" (2.54m x 1.81m) Having a three piece suite comprising claw foot slipper bath, low flush w.c., pedestal wash hand basin, part tiled walls, tiled floor, chrome heated towel rail. 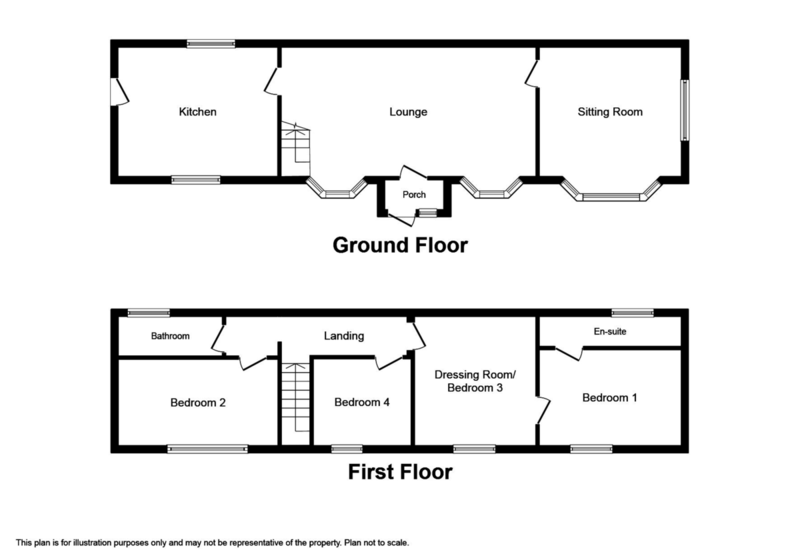 BEDROOM FOUR 9′ 7" x 8′ 9" (2.94m x 2.68m) Radiator, power points, double glazed window overlooking the front elevation. OUTSIDE Pedestrian access to the front with onamental garden with steps leading up to the side of the property. Steps lead to a terraced garden where there is a decking area, timber constructed garden store, floral beds with a variety of plants and shrubs. Further steps lead up to a large decking area which enjoys panoramic views over the Vale of Clwyd towards the Coast, Snowdonia and the Great Orme and beyond. This area is ideal for al fresco entertaining with raised rockery beds with various plants and shrubs and a timber constructed summerhouse. SERVICES Mains Electric, Water and Drainage are believed available or connected to the property, and heating by way of Oil. All services and appliances are not tested by the Selling Agent. DIRECTIONS From the Prestatyn Office proceed along Meliden Road at the traffic lights turn left onto Waterfall Road, proceed to the top to the traffic lights, continue straight over and bear immediate left onto Cwm Road, continue along Cwm Road, take second left onto Lower Foel Road and the property can be seen on the right hand side.